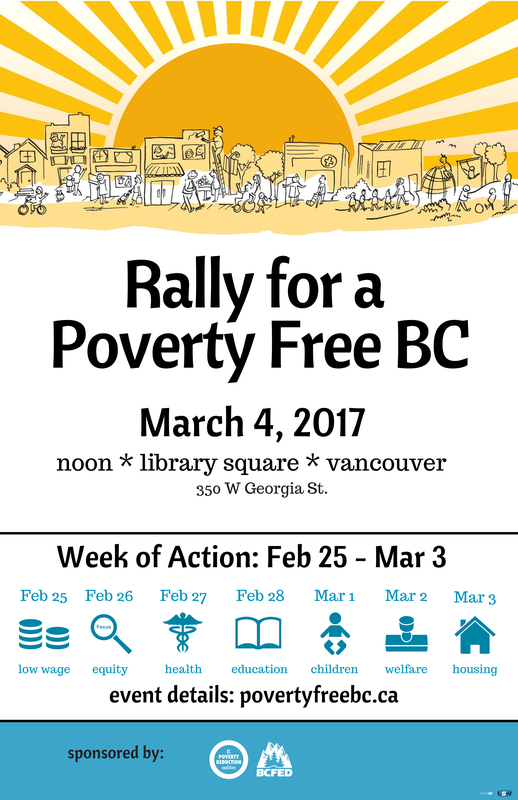 The Vancouver Neighbourhood Food Networks are proud to join the BC Poverty Reduction Coalition, Raise the Rates BC and the BC Federation of Labour and many other groups to Rally for a Poverty Free BC. We understand that lack of food access is largely a consequence of poverty. This is our chance to raise our voices together and show candidates in the provincial election that we’ll be voting for politicians that commit to a strong, comprehensive poverty reduction plan. There will be a week of action leading up to the rally (Feb. 25 – Mar. 3) with each day of the week lined up with an essential pillar of an effective poverty reduction plan. There will be film screenings, panel discussions, webinars and more. Stay tuned for more information!